IT Outsourcing Companies | 8x8, Inc. IT Outsourcing Companies Vs SaaS: Which One is Better? Outsourcing is a popular term among businesses today. The process of outsourcing lets you shed non-core business activities to a third-party individual or organization so that you can focus on what matters the most for your business. It essentially allows your company to grow without making more investments in hiring resources and managing them. Today, almost every organization outsources certain business functions to third-party companies that specialize in handling the individual functions efficiently. These often include customer support, business processes, HR as well as IT. Talent Access: Outsourcing provides you with an opportunity to access a large pool of talent at a much lower cost. It takes away the need to hire more resources or train existing ones. Better Utilization of Internal Teams: Shedding non-core business activities means your in-house teams can focus on more meaningful tasks that matter for the business growth. Better Efficiency: Spending less time on non-core business functions inevitably helps you improve the overall operational efficiency of your organization, making it much easier for you to serve your end customers better. What Are IT Outsourcing Companies? Outsourcing any of these IT functions relives your in-house team from the burden of managing multiple tasks at a time and eliminates the need to hire new resources or invest in costly IT infrastructure. However, this traditional IT outsourcing model is now being challenged by cloud computing technologies that offer similar solutions and services, but with a greater flexibility and control. SaaS or Software as a Service is precisely driving this change. SaaS is relatively a new outsourcing model with features that include a hosted application, providing a service to customers through the internet. The applications can be customized as per your requirement and can be deployed quickly, requiring no on-premise IT setup. This type of model is often provided by cloud service providers, removing the need to install applications on computers or internal data centers. UCaaS (Unified Communications as a Service): It is a software application that unifies all business communications such as instant messaging, voice and video calls, emails and conferencing into one single system. This type of application is ideal for businesses that have geographically dispersed teams and have multiple vendors and partners. UCaaS simplifies business communications and enhances the productivity to a substantial level. CCaaS (Contact Center as a Service): CCaaS is a dedicated application for customer support consisting of modern call center features such as IVR, analytics, reporting and much more. Businesses need to pay only for the technology they require, thus reducing the upfront investment required. CCaaS is an ideal solution for companies who have a dedicated customer support desk. VoIP (Voice over Internet Protocol): VoIP can be considered as a part of UCaaS which involves managing business communications such as audio and video through the internet rather than analog telephone lines. 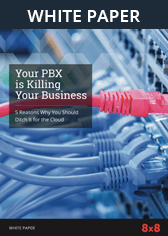 Traditionally, this requires setting up an on-premise IP-PBX server to send and receive voice or video data through an IP (Internet Protocol) network. However, SaaS eliminates the need for businesses to maintain the servers internally. This new model of IT outsourcing is increasingly taking over the traditional outsourcing methods because of the ease of distribution, global availability and the flexibility to opt for services according to the organization needs. SaaS is more powerful when it comes to managing and protecting a company’s IT infrastructure over the traditional IT outsourcing companies. It also allows businesses to access the latest data-driven technologies such as analytics as well as business tools integration capabilities, which is seldom possible with traditional outsourcing set up. SaaS as such is inevitably the future.